Hawaiian grown Grammatophyllum Orchids from Kawamoto Orchid Nursery. We currently have 3000 Grammatophyllums in stock. These plants are really easy to grow and seem to double in size every year. Great orchid plants for landscaping and floral use. The generic name Grammatophyllum is derived from the Greek words gramma, meaning "a mark or character," and phyllum, "a leaf." This probably refers to the varied markings on the petals and sepals of the flowers, which resulted in Grammatophyllum frequently being called the "Letter Plants." Grammatophyllums produce short thick psuedobulbs which are not covered leaf bases and bear a few leaves around the top of the psuedobulbs. 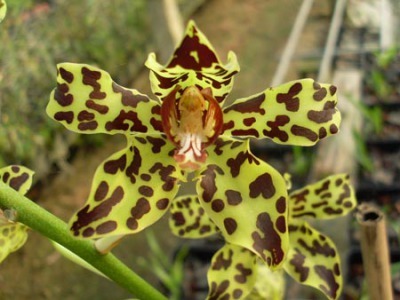 The flowers of most Grammatophyllum species, are generally yellow, brown, green and spotted, and are found throughout the islands of the Malaysia, Philippines and New Guinea areas. Light- Grammatophyllums grow well in moderate to high light intensity (30-35% shade). These plants usually acclimate very well to full sun and are often used in landscaping (Often seen mounted on trees). Lime green colored foliage is an indication of proper light. Dark green foliage, while very attractive, is not conducive to the plant reaching it's full blooming potential. Yellow colored foliage indicates too much light. In very mild climates, most members of this can be grown out of doors, with protection from the colder nights of winter. Watering- We suggest to watering every 3 days or twice a week during the hot summer months. They should not be allowed to go completely dry, yet they don't care for a soggy environment either. We suggest watering once a week in the winter and early spring months, when weather is colder. Humidity- Grammatophyllums like it warm and very humid. The humidity level should be at least 50% or higher. Increase the amount of humidity in the summer months (Mist the leaves daily). Make sure the plants have good air circulation. This will help prevent fungus, insect problems, and mold from forming on the leaves. TEMPERATURE- The ideal temperature range for most grammatophyllums are 75°-85°F. during the day and 55°-6O°F. at night. Plants will tolerate temperatures to 45°F (if not wet) and up to 100°F for short periods. At higher temperatures, air circulation and humidity must be increased. FERTILIZER- Grammatophyllum plants should be fed consistently. we suggest using a Balance type fertilizer 20-20-20 or 15-15-15. From Spring through early Fall, fertilizing every seven days, with several clear waterings in between. In the late Fall through Winter, a light feeding once every other week. Repot- We suggest repotting your Grammatophyllums every 2 years. Usually you can go up 2" inches in pot size from your last pot. This type of plants grow really fast and usually double in size every year. Use large decorative bark chunks to wedge the plant in the pot, the roots should fell the pot and become very root bound.